'Cagefighters from the Rock' is an action-packed comic book created by Mike Radich and Martín Cóccolo, which tells the tale of an escaped criminal, named Brad Chaney, who seeks revenge against the man who sent him to prison: Namely, the mayor of Empire City, Jason Larkin. Basically, Brad kidnaps Larkin, and with the aid of plastic surgery, takes his place in order to destroy the city and Larkin’s reputation. Want to know more? Then please check out the following interview I did with Mike Radich. Please enjoy. 1) What are your own origins, Mike? I'm a strange visitor from another planet who came to Earth with powers and abilities far beyond those of mortal men. No, wait a minute, that's not me! My parents were killed in Crime Alley, and... no... that's not me either. Well, I guess my origin story is really boring. My life is my work, and my work is my life. I've worked in MMA (Mixed Martial Arts) media since 2009, and host a podcast called "Really Random with Radich" on YouTube. I'm not a very good fan because I can't just be a fan. If I love something then I have to work in that field. I love MMA, so I work in the MMA business. I also love comic books, so now I'm in the comic book business as well. That's just the way things have always been for me. 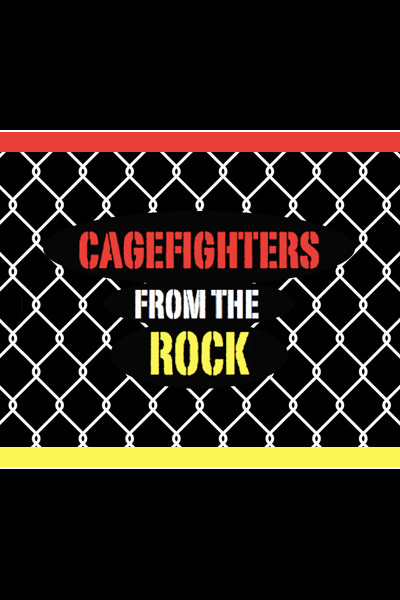 2) What inspired you to create, ‘Cagefighters from the Rock’? I have three great loves: MMA, comic books, and old movie serials. I wanted to make a comic book that included MMA, but I wanted to do it in the format of the old Saturday matinee movie serials of the 1930s, 40s, and 50s. "Cagefighters from the Rock" truly is unlike anything you've ever seen before because of this movie serial format. I’ve taken that old format, remixed it, and updated it for a modern audience. 3) In your own words, how would you describe this story? 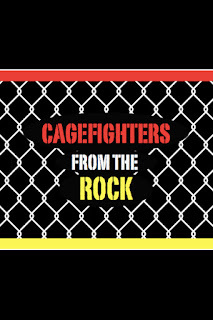 "Cagefighters from the Rock" has everything you could possibly imagine: MMA, action, adventure, excitement, and mystery... and that's not an exaggeration, it's the truth. There's something in this story for everyone because we have so many different moving parts over the course of all twelve chapters. "Cagefighters" isn't your traditional MMA story though. There's no big tournament, there's no one fighting to get into the UFC, and there's no one fighting against their estranged, older brother. No. There's none of that. I wanted to write a comic book that was an action-adventure story with MMA, not just an MMA story. You don't have to be a fan of MMA to enjoy my story, but if you are a fan of both MMA and comic books, then this is the story you’ve been waiting for. 4) What song would you say best represents this comic and why? Well, I am doing a crowd-funding campaign on Indiegogo right now, so I'll have to go with "Give a Little Bit" by Supertramp (or the Goo Goo Dolls, depending on what version of the song you've heard). I decided to pick this song because if you back my project on Indiegogo, you will be giving a little bit of your love to me, and showing that you care about the work I'm doing. I have so much I need to share, but I need funding before I can show the world my story. 5) If you could get a celebrity – either living or dead – to promote your wares, who would you choose, and why would you want to choose this particular person? This might sound weird, but I have to go with Kris Jenner. I still don't know what they do, but she turned the Kardashian name into a household one. So with that being said, I know she could do amazing things if she promoted my work. 6) What have you learned about yourself through this endeavor? I suppose I've learned that 2003 was the most important year of my life, because during that year, I started watching MMA and reading comic books. When I was ten I was a fan of superhero movies and TV shows, and because the source material of these shows comes from comics, it was only a matter of time until I would pick them up. During that year I also met comic book legend, Frank Miller, at a bookstore signing he was doing near where I lived. I didn't know it was him at the time, but I do now, and I'm a huge fan of the guy. He gave me great advice after I told him I wanted to be a comic book writer when I grew up. Later, I would learn that it's advice he gives everyone, but it still meant a lot to me because it was real advice, and not some random "feel good" advice adults usually give young kids. He told me, “Know your ending”. It doesn’t sound like much, but for the project I’m doing its pure gold. On the MMA side of things, PRIDE was my first introduction to the world of mixed martial arts. The first event I ever watched was 'PRIDE 25: Body Blow', and even though I didn’t know what I was watching, I liked what I saw and I've been a fan ever since. 7) If ‘Cagefighters’ had a motto, what would it be? "Fighting is always the answer." People think fighting is a dirty word, but it's not, we're all fighters. Whether you fight in a cage for money in front of millions or fighting a terminal illness in a hospital bed, we all have to fight for or against something at some point during our lives. In "Cagefighters from the Rock", fighting will give our heroes the answers to who killed their coach, and the true identity of the mysterious figure who goes by “A Friend”. 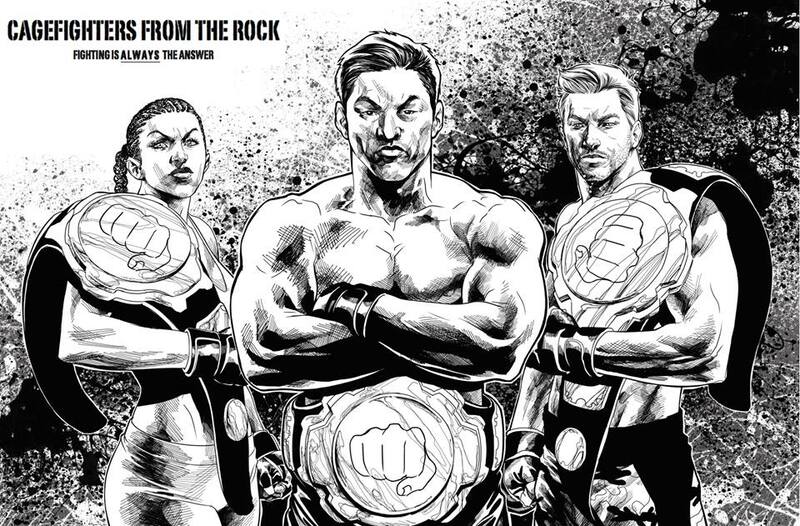 And on that note, I'd like to thank Mike for telling us about his comic book, ‘Cagefighters from the Rock’, before encouraging you to check out his facebook, twitter, instagram, and indiegogo pages.